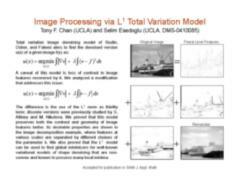 In joint work with Tony F. Chan, we investigate the effects of replacing with the L1 norm the fidelity term in the Rudin, Osher, Fatemi (ROF) total variation based image denoising model. There are a number of interesting and desirable conseqences of this seemingly modest modification, such as contrast invariance. With Stan Osher, we consider anisotropic versions of the ROF model. Chan, T. F.; Esedoglu, S. Aspects of total variation regularized L^1 function approximation. SIAM Journal on Applied Mathematics. 65:5 (2005), pp. 1817-1837. Esedoglu, S.; Osher, S. Decomposition of images by the anisotropic Rudin-Osher-Fatemi model. Communications on Pure and Applied Mathematics. 57 (2004), pp. 1609-1626.